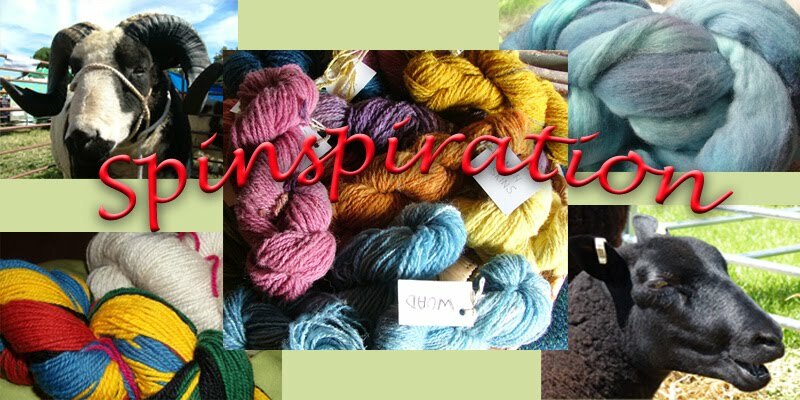 Spinspiration: Dawns January Woolly Wednesday - back to the wheel! Dawns January Woolly Wednesday - back to the wheel! Well with all the excitement of Christmas, this could be a quiet month for Woolly Wednesday, I wonder how many will be joining in this month? I have a few things to share. 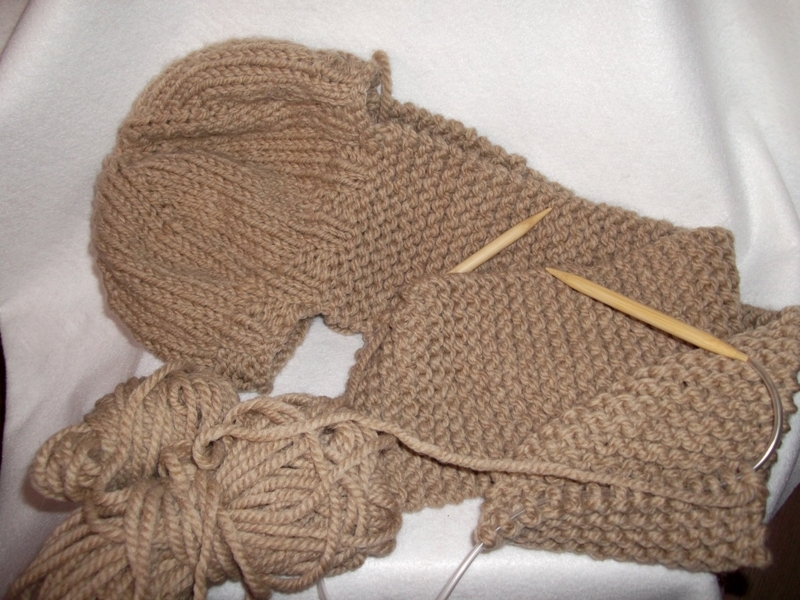 Firstly some knitting projects that were Christmas gifts. 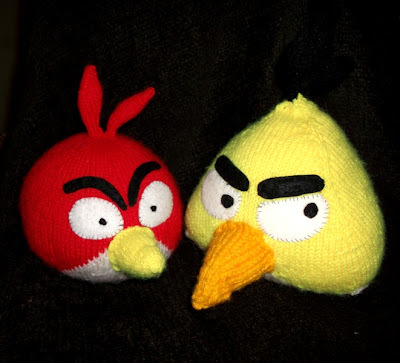 Here we have two novelty knits made for my husband Alex who enjoys playing Angry Birds from time to time, Imogen does too when she sees him playing it. They have already been introduced to Imogens other toys and enjoyed a tea party or two. Easy to follow free patterns from Ravelry, there is a third (the green pig) in progress but unfinished at present. 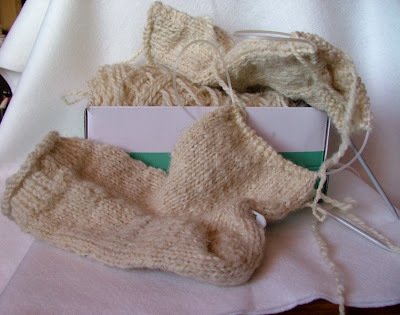 Also unfinished (but working on them) are the house socks for Alex from some handspun Dorset Horn. Lovely chunky wool so these will be lovely - a few more rounds on the foot and then the toes to do and they are completed. I want to knot more socks and like that these have been done 2 at a time on one circular needle - they grow at the same rate so you know they will be even and it avoids the Second Sock Syndrome (SSS) where the 2nd sock doesn't get knitted straight away if at all. Anyway, hopefully I can reveal these finished next month. 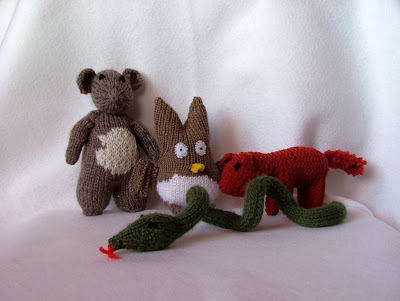 Also knitted some animals for Imogen to go with her Gruffalo toy so she has a play set - I have knitted an owl, fox, snake and a mouse. We bought her the Gruffalo hand-puppet for Christmas too so when The Gruffalos Child was on the BBC on Christmas day evening, it was re-enacted with her puppet and toys - her Gruffalo toy she has had for years was acting the role of the Gruffalo's child. I do intend to knit her a Gruffalo toy too from a pattern I have and am going to adapt it to make her a Gruffalos child. Another watch this space for results. Almost finished knitting A hat and scarf combination for Imogen - just adding a few more rows to the scarf to make a kind of pocket to pop cold hands into. Here it is so far. So on now to spinning, and yes this month there has been some spinning - yay! We were away staying with family for Christmas but on return I had the urge to spin, and have been getting back into the rhythm of it. 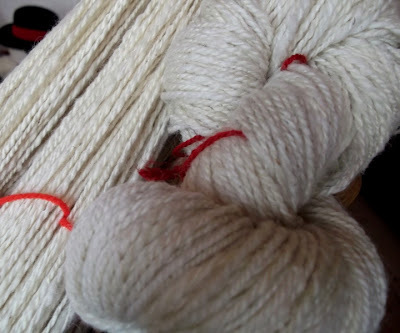 Here are two skeins of Portland rare breed (classified as at risk) fleece. This is a lovely soft bouncy fleece, creamy white in colour. 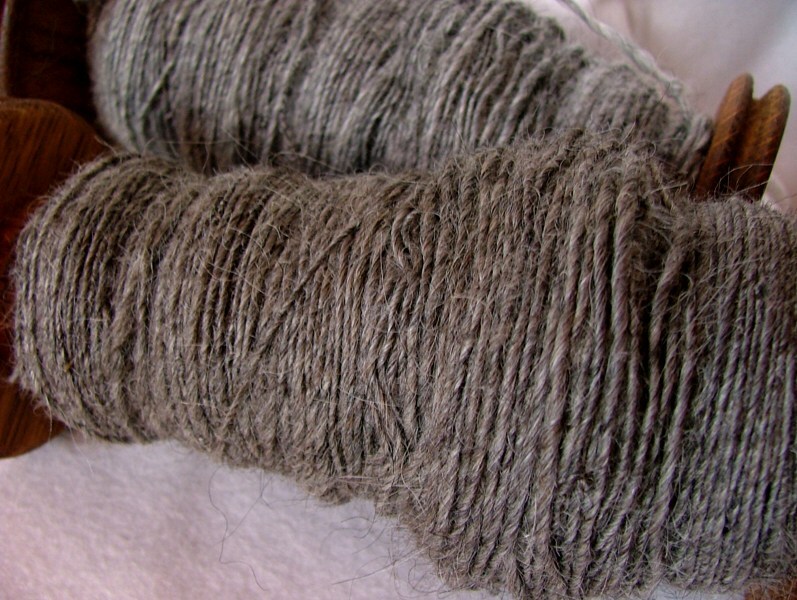 Two skeins 2-plied, each weighing approximately 200g each - 168 metres (183 yards) and 170 metres (185 yards). I'm thinking of dyeing these. Really want to get more dyeing done this year. 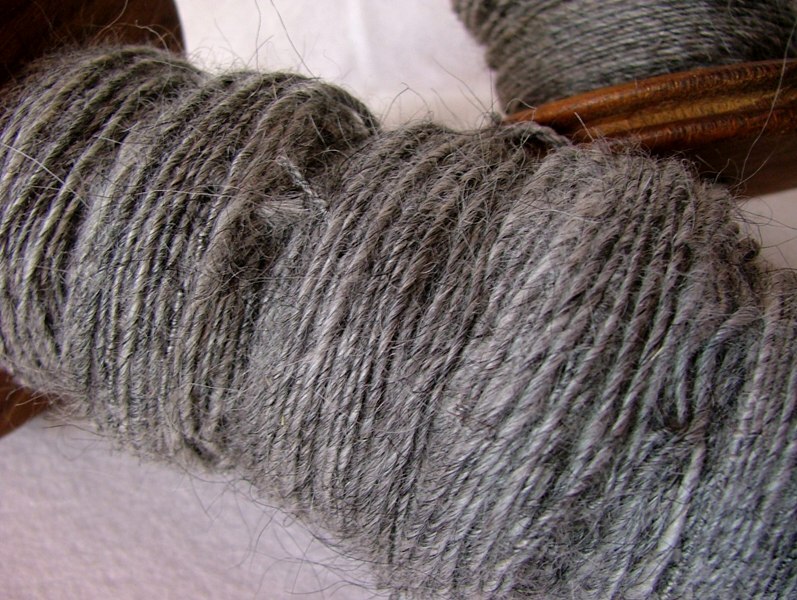 Next is some Icelandic grey wool that I started spinning in September at the Romsey Show - it was still sitting there on the bobbin waiting to be completed so it now has been. Here is 100g of single ply which I think I am going to set as single ply as it's a nice long staple and a good strong yarn as it is. Inspired by finishing the Icelandic grey, I dug out another 100g bag of another Icelandic fleece - a slightly different shade - of grey with a hint of brown. It's only to the naked eye you can see the difference in them. Again keeping this as a single. I did consider plying them together but think something would be lost in doing that. 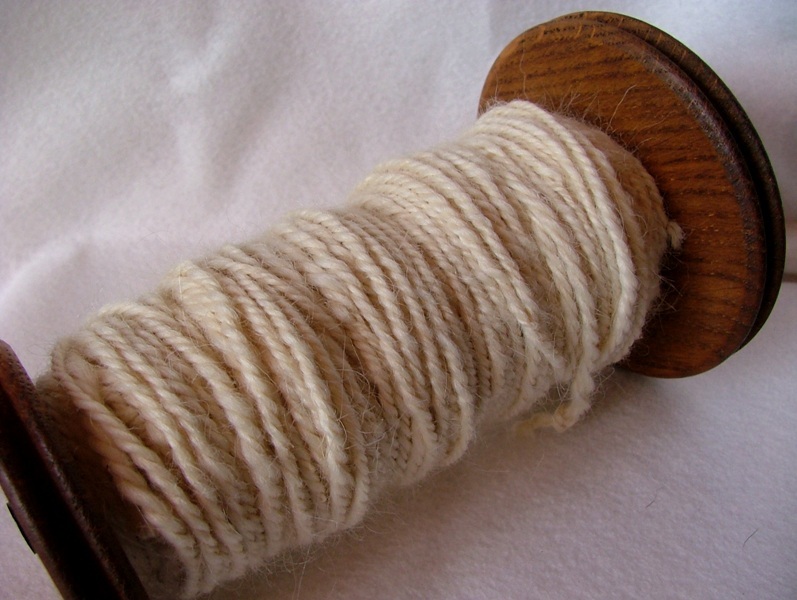 Still on the bobbins - awaiting winding off onto the niddy noddy to set the twist, so no idea on length spun. 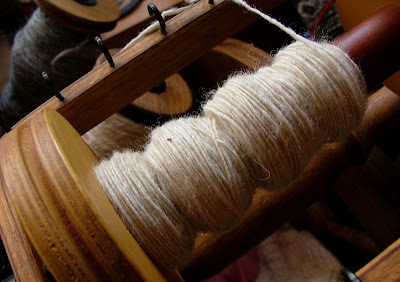 More spinning - this time some White Lincoln Longwool fleece that I have - approximately 100g spun into a single and navajo plied, resulting in quite a chunky yarn here. I have more of this fleece but think I will two ply it in future. A lovely soft fleece, another rare breed at risk. Lovely long staple and a great lustre to the wool too. I have borrowed the Guilds combs to prepare the rest of this fleece as it is too long really for carders. Hopefully no injuries will occur using these instruments! They are pretty mean looking. Phew I think that's it. So really quite busy in just over a week but it has been great getting back to the spinning wheel. I am now working on a Dorset Horn fleece - remember the post about the fleece with a break in it? Yep, that one - it has washed and dried lovely and is in lovely locks ready to spin, I am carding it too and it is so fluffy and bouncy and soft. I am in the process of organising the fleeces I have and will be sorting out some to de-stash, always meant to do this with the last lot of wool but have not got around to it - so if anyone is interested in a fleece I shall pop on a post soon with what I have. It is all unwashed raw state fleece, skirted of any rubbish but still with some vegetable matter (VM) in it and in need of washing but lovely wool for spinning or felting, free for postage at cost. Looking forward to seeing what everyone else has been doing, or what are you planning to start soon?